I recently built a large entertainment centre that needed several identical slots cut in it for cord and cable access. Cutting them wasn't difficult. But getting them all identical, with clean edges was another story. 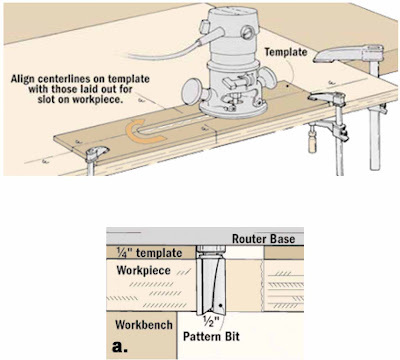 To do this, I used a handheld router and a pattern bit guided by a shop-made template. The template is just a piece of ¼" hardboard with a cutout that matches the final size of the cord access slot. I made the template wide enough to support the base of the router. It also needs to be long enough so that the router base won't hit any clamps. After cutting the template to size, you're ready to lay out the slot. The idea is to centre the slot on the width and length of the template, leaving the centrelines visible. (Later, they'll serve as reference lines so you can align the template on the work piece easily.) Now creating the slot is just a matter of drilling two end holes and roughing out the waste with a jig saw. Then sand (or file) up to the layout lines to provide a smooth edge for the bearing to ride on. Before using the template, you'll need to lay out the centrelines for the slot on the work piece. Just be sure these lines extend far enough so they won't be covered once the template is positioned. 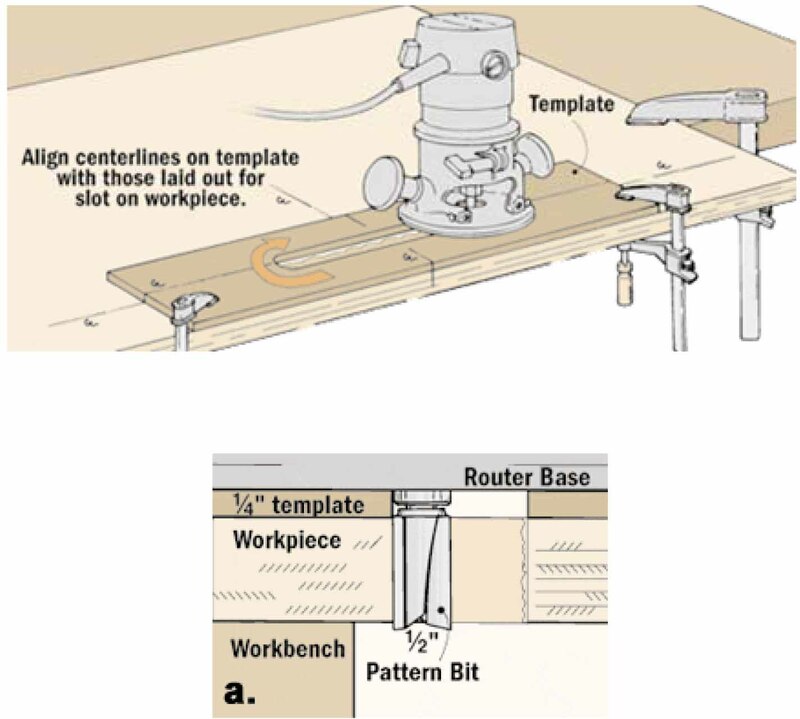 Then rough out the slot in the work piece with the pattern bit and the router. Now it's time to remove the remaining waste. This is where the template pays off. Just align the centrelines on the template with the layout lines on the work piece and clamp it in place (see drawing). Note: To avoid cutting into the bench top, make sure the work piece hangs over the edge of your bench. To clean up the slot, clamp the template to the work piece, making sure the centre lines align. Finally, rout in a clockwise direction, as shown. The pattern bit cuts a smooth clean edge that matches the template (see detail a). You describe us the simple of cutting identical slots. Thanks for sharing with us. I also user of essayroo which is showing us that how to easily roll up an extension cord like a contractor and check out more things.